Alexander John Chandler, or A. J., was born in 1859 in the small town of Coaticook, Quebec. After completing secondary school, he attended McGill University in Montreal where he studied veterinary medicine. 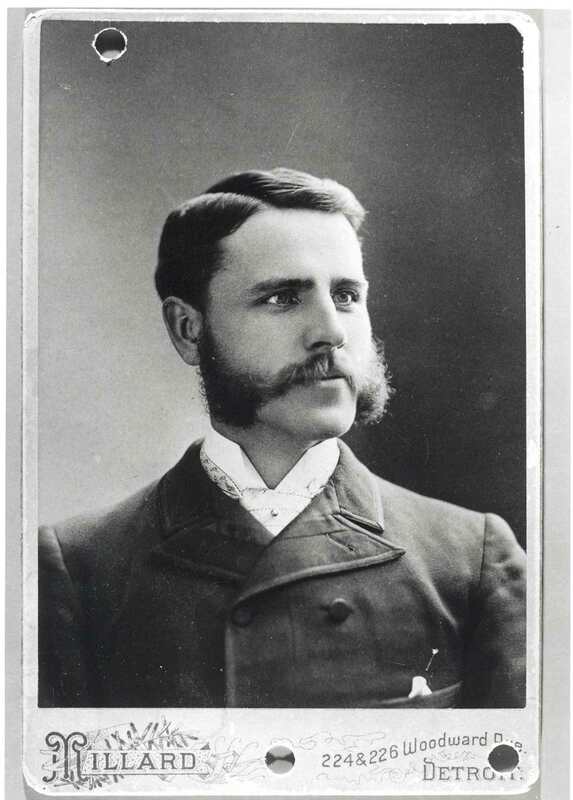 Graduating in 1882, Chandler worked as a livestock inspector for the Canadian government before going into private veterinary practice in Detroit. When representatives from the Arizona Territory approached him with an offer to become the territory's veterinary surgeon, A. J. quickly accepted, despite the significant decrease in pay. He arrived in Prescott, the territorial capital of Arizona, on August 8, 1887, in the midst of a drought. He decided it was better to resign his position and seek opportunity in California, but before he left he toured the Barbacamori Ranch in southern Arizona after a monsoon storm. The tour made him realize that the key to desert development was controlling water. He continued to California to study irrigation techniques, and returned to Arizona to start an ambitious plan to accumulate land and water rights in the Salt River Valley. With capital from his partners Dexter Ferry and C. C. Bowen, and with a scheme to take advantage of loopholes in the Desert Land Act, Chandler went about the business of building a network of canals and accumulating a massive amount of land south of the Salt River Valley. The end result of the project was the establishment of the town of Chandler, Arizona, centered around the luxurious San Marcos Hotel. A. J. was married three times, but never had children of his own. He married his first wife Julia Pope Chandler on September 23, 1890. She was the daughter of a St Louis, MO judge. She left him in 1913 and moved to California. His second wife, Charlotte Boyd Chandler, was an entertainer from Philadelphia who suffered from several health problems. After a short marriage, Charlotte passed away. Dr. Chandler's third wife was Rosa Bell Chandler Wilson. Rosa survived Dr. Chandler by nearly forty years. She had two children from a previous marriage, and after A. J. 's death she moved to Virginia and remarried. To see additional pictures of Dr. Chandler, click HERE. To read documents articles about Dr. Chandler, click HERE. To read newspaper articles about Dr. Chandler, click HERE. -"From the amount of inquiries over on the coast regarding this section, I look for the greatest fall and winter in the history of the Salt River Valley," said Dr. Chandler. "Prospects are very good. With such a good administration as we have at present to straighten out the money situation. It means great things for the Valley." "The cotton outlook over in the Chandler vicinity is very bright. About 1,500 acres are planted. It is in bloom now, and the cotton boils are forming. It will be ready to pick by the last of September." The 1920, 1921 and 1923 Chandler City Directories list him as president of the Bank of Chandler, Chandler Improvement Co., Chandler Water & Power Co., Chandler Land Securities Co., and Consolidated Canal Co. His residence was the Hotel San Marcos. 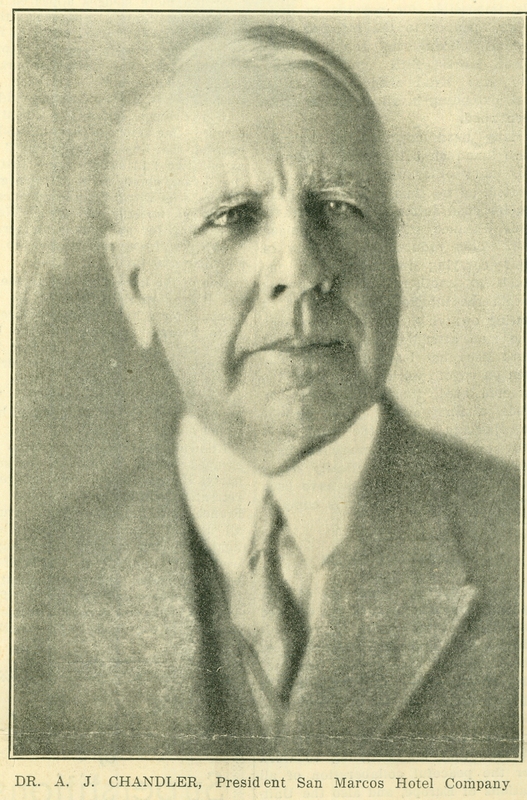 The 1921 directory adds that he was also president of the San Marcos Hotel. The 1925 and 1926 Chandler City Directories said he was president of San Marcos Hotel Co. and the Bank of Chandler and that he and his wife Charlotte lived at the San Marcos Hotel. 1929: He was president of Chandler Improvement Co., Chandler Heights Citrus Inc., Chandler Land & Securities Co., Consolidated Canal Co., San Marcos Hotel Co. and Bank of Chandler. He lived at the San Marcos Hotel with Charlotte. 1930: President of Bank of Chandler, Chandler Improvement Co. and Consolidated Canal Co. He and Charlotte lived at the hotel. The 1931 directory said he was president of the bank and improvement company and that he and Charlotte lived at the hotel. The 1932 directory said he was president of the improvement company and that he and Charlotte lived at the hotel. The 1940 Chandler Resident Directory also said he was president of the Chandler Improvement Co. and still lived at the hotel, with the phone number 49. Browse ChandlerpediA/Businesses A-Z/C/Chandler Land & Securities Co.
Browse ChandlerpediA/People/People A-Z/J/Johnson, Walter E.
Browse ChandlerpediA/People/People A-Z/B/Bowen, C. C.
Browse ChandlerpediA/Businesses A-Z/C/Chandler Water & Power Co.
Browse ChandlerpediA/People/People A-Z/F/Forbes, Ada C.
Browse ChandlerpediA/Businesses A-Z/C/Chandler Heights Citrus Inc.
Browse ChandlerpediA/People/People A-Z/C/Clark, Edith B.
Exhibits/Chandler History: A Primer/Who was Dr. Chandler? Exhibits/FAQ: Chandler/Where did Dr. Chandler come from? Exhibits/FAQ: Chandler/What is the connection between ostriches and Chandler?